It has been a long, cold winter in the Highlands this year, but finally spring seems to have arrived, just in time for the first West Highland Way trek of 2018! I was the Walking Guide for the trip with Ollie supporting as the Trek Manager. 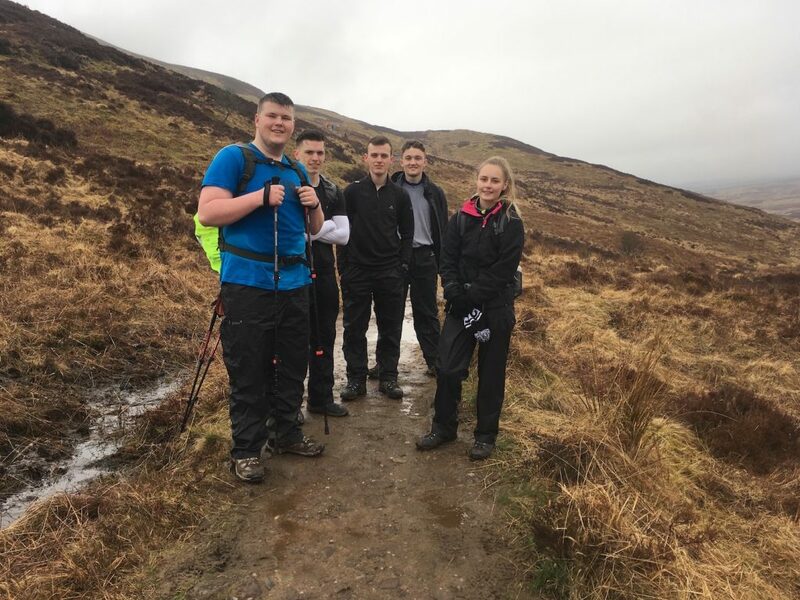 We met our team for the week, five apprentices (John, James, Steph, Niall & Alex) up from London on a team building exercise, in Milngavie on Saturday 7th April and, over a meal, we introduced ourselves and the route. After a good nights rest, and a morning visit to Tesco for some supplies, we headed over to Milngavie Town centre, gathering for the obligatory team photo by the obelisk marking the start of the way, then commenced our journey north! 8TH APRIL – DAY 1 – MILNGVIE TO DRYMEN We set off at 0930 and made good progress along the first section of the way by Allander Water and then into Mugdock Country Park, making our first stop at Craigallian Loch. It was a busy morning on the way with lots of people out enjoying their Sunday on the route with quite a few runners around. From the loch we continued through Carbeth, then down to meet the old railway through Strath Blane with lovely views to Dumgoyne and the Campsie Fells and we got a fly past from a rather noisy Merlin. The weather was good – dry and calm but overcast, which kept the temperature down, making for ideal walking conditions. By 1230 we’d reached the Beach Tree Inn. 7 miles already covered, it seemed a good place to stop and have a well-earned lunch. After lunch we continued along the old railway avoiding the occasional boggy bit and kept a steady pace until Gartness where we took another break at the bridge over the Endrick Water by the scenic row of old cottages. It briefly tried to rain just as we walked on but by the time we were making our final descent down quiet country lanes into Drymen it was t-shirt weather with glorious sunshine. We reached Drymen shortly before 1500, having made really good time for the day and, although there were one or two sore feet in the group, day 1 was a definite success with the first 12 miles in the bag. 9TH APRIL – DAY 2 –DRYMEN TO ROWARDENNAN Day 2 saw us move from the Lowlands to the Highlands with an associated change in landscape and terrain through the day. After meeting the group at their campsite we made for Drymen. Starting through the Garabhan forest we had dry and misty conditions but as we started to enter open areas of clear felling the rain started and by the time we left the forest we had full waterproofs on with torrential rain falling – much earlier than the forecast which said it would stay dry till 3pm! However, the rain had pretty much stopped by the time we reached the burn below the climb onto the shoulder of the Conic Hill. A brief stop here preceded the steady ascent. The team found it a challenging step but John and James still had the energy for a quick dash to the actual summit from the way’s high point. We got some hazy views down over the loch from path with the cloud sitting just on the ridge and there were still a few patches of snow in sheltered locations despite the warm temperatures of the past few days. Ollie was there to meet us in Balmaha and we had lunch at Weir’s Rest in nice conditions. A well-earned, long rest was had before setting off once more. 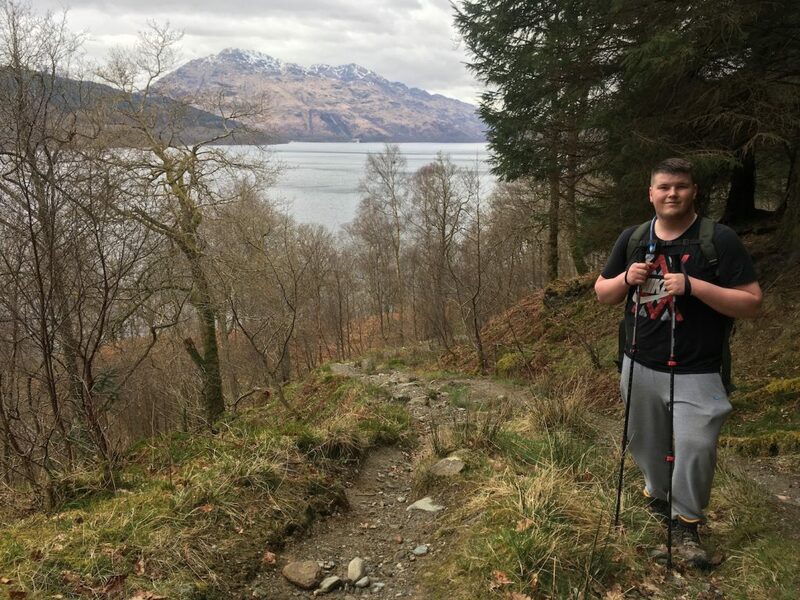 It took a while for muscles to loosen off again but soon we were walking steadily with some stunning views over the perfectly calm waters of the loch to the forested islands and the Luss Hills beyond. We stopped to skim some stones and a few photo opportunities around Milarochy before heading into lovely native oak and birch woodland around Cashel and up through Sallochy. Further on in Ross Wood pine trees became a bigger part of the mix and with some fleeting glimpses of snow-covered hills through the trees you could tell we had entered the Highlands. With a bit of sun starting to break through the cloud it turned into a fine afternoon although it was always colder than yesterday. We passed by Mill of Ross which was particularly stunning on the day with a lovely little burn tumbling down by an old cottage and daffodils in perfect condition right by the way. There were a few places where the gorse was starting to bloom as well – definite signs of spring! The final climb over the hill at Ross Wood was a tiring step late in the day for the group but the end was near and we reached the van around 1830, another successful day and 14 miles to add to the tally. 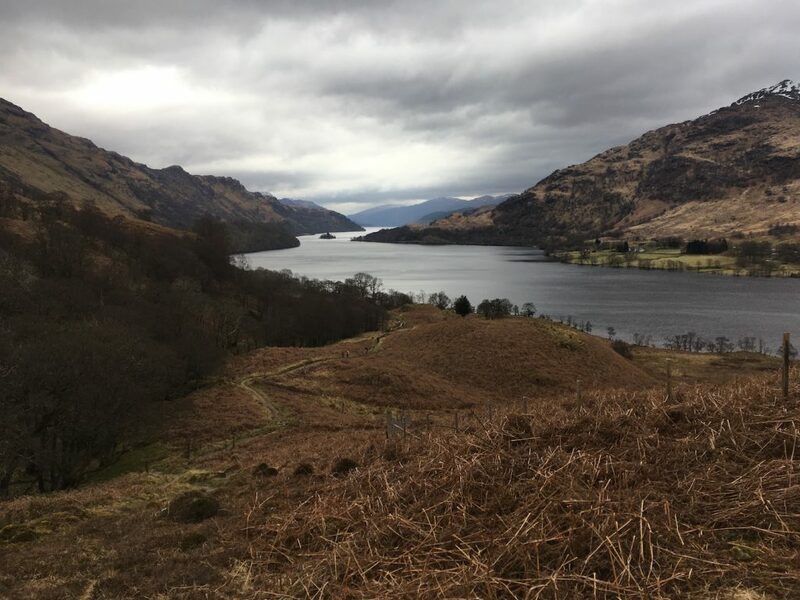 10TH APRIL – DAY 3 – ROWARDENNAN TO INVERARNAN This was a tough day for our group but through amazing scenery with great views of the surrounding mountains still holding a fair amount of snow and it remained predominantly dry despite it seemingly raining everywhere else! We met the team at their campsite at 0820, got tents packed away, then headed round to Rowardennan, starting our day’s walk at 0930. It was a chilly, grey morning and the keen easterly wind had a good bite to it. However, we soon got into sheltered ground below the steep hills surrounding Loch Lomond and they shielded us from the breeze for much of the day, once again making for perfect walking conditions. The first half of the day was a steady walk, first along the shores of the loch past Ptarmigan Lodge, then up into the trees as we stuck to the higher track above Rowchoish Bothy. It started to brighten up a little as we went and by the time we rejoined the lower path, the Arrochar Alps were in full view across the water. Gradually the pace slowed as we picked our way along the more undulating lochside path, passing Cailness, which looked particularly scenic in the spring conditions and then onto Inversnaid, with Craigroyston wood giving us our first taste of the rougher terrain to come. Just as we reached Inversnaid, the day’s only rain came on, light but steady, so lunch was had under the canopy of the hotel. Niall had had enough and decided to finish his day here. After arranging a pick up with Ollie we left him at the hotel with a ready supply of Irn Bru and headed on up the lochside. It was hard going on the narrow path along the northeast shore of the loch with lots of ups and down, clambering round boulders and taking care not to slip on the many tree roots and boggy sections. Despite the strenuous nature of the walking is was lovely to be frequently down by the crystal clear water at the edge of the loch, walking through the native oak woods with bright mosses, lichens and the first primroses of the season adding some colour to the scene. Eventually we reached the infamous ladder that climbs up to a bridge over a lovely waterfall tumbling down black slabs, and soon after we reached an idyllic beach with views south down the loch where we stopped for a break and more stone skimming. From here we made steady progress northwards to Inverarnan, with much easier underfoot conditions. We had a brief look into Doune Byre Bothy, a stop to admire the final views of Loch Lomond and were soon descending to Beinn Ghlas Farm. We reached the farm around 1730 and headed for Tyndrum. Tents up again, it was time to leave the team to have a good nights rest before tomorrow’s adventures!